Web Table quick blogging - What is that good for? Just click "UPLOAD POST" and your latest news is on the web. You should have access to a web service with access to upload html files and images via FTP. And of course you should have that user name and password at hand. Also you will need the URL where to access your blog posts. There is no installation of the blog tool needed. Just unzip the archive to a folder on your computer. Register your web space. Just 50 MB disk space can be enough. PHP or MySQL is not needed. But it must allow you to upload files via FTP. Download the WebTable software archive from below. Unpack the WebTable software to a separate folder and keep the subdirectories. As the program starts you will be prompted to select the configuration settings file. At the first start you don't have one. So you just cancel the file open dialog. Then select "EDIT FTP CONFIG" from the main menu. Fill in the required information and select "SAVE AS..." to generate CONFIG.INI . If you can accept the selected fonts and color design then just leave the provided WT.CSS as it is. You can use the "EDIT DESIGN CONFIG" from the main menu to adjust the appearance of your blog. Experts may edit the configuration style directly by using proper CSS language. When FTP account data is properly set up then fast blogging can begin. The calendar display in the program window is set automatically, but can be changed if you want to write about yesterday. The blog post is expected to have a head line and a text body. So just type your information into those fields. 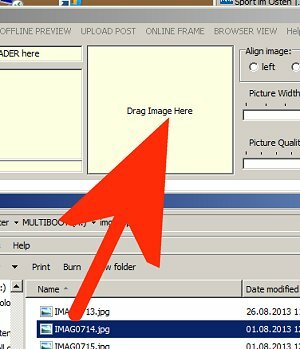 If you want to have a picture added then open your windows explorer and drag a photo (JPG) from your images library onto the blogging tool's image field. The picture is re-sized to fit in the image field. The sliders are used to set the width and quality of the images inserted in the blog. Better quality or larger size means more data volume. Keep this in mind - according to your storage space and traffic allowance. Maybe one day you are running out of web space: You can save some data volume by lowering image quality. Use the LEFT or RIGHT radio buttons to align the image, or check NONE if you prevent the displayed image from being published. When everything is set you should press the SAVE LOCAL button. The latest post is put on top of your blog and all content will be displayed in the preview pane. You can still edit the text content and image properties of the unpublished posting. You can even play around with the color scheme by selecting a different CSS file in the "Edit Design Dialog". When done press SAVE LOCAL again to see the effects. Finally select UPLOAD POST from the main menu. 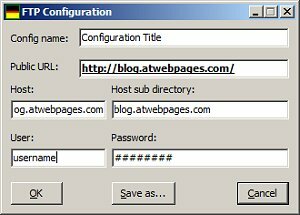 The programm connects to the FTP server and uploads the updated files and images. Now you can check your public URL to see the published content. If the program can not find the configuration files shipped with the archive the software creates 10 files as templates for your future blog postings. They have no content in the beginning	but will fill up when you are publishing and do provide space for 10 postings. Older posings are deleted. At the first start two more additional files are created. There will be a HEADER.HTM and a FOOTER.HTM in your program folder. They contain the basic HEAD and TABLE tags which will be linked to your posting files. So the software makes up the web page consisting of proper HTML syntax. You can edit the HEADER.HTM to create an individual intro on top of your web page. Remember to have the "<TABLE>" tag as the last line in HEADER.HTM . Also start the FOOTER.HTM with the "</TABLE>" tag in the first line. These tags will wrap your postings generated by the program into a proper table. Adding some more text to the footer file will give you an individual bottom line. Remember to have 2 lines "<HEAD>" and respectively "</HEAD>" in the HEADER.HTM file. The call to read the CSS file containing your selected color schemes is inserted between those two lines. To change some basic editor settings and to select the standard design with font definitions and color scheme, open the DESIGN CONFIG DIALOG to set up the most important values and activate the desired CSS style. Save the combination of FTP account data and CSS settings by using the SAVE CONFIG menu. Give the configuration file a descriptive name. Writers with more CSS experience can use a 3rd party text editor to optimize the CSS files or create new ones. Place CSS files in the CSS subdirectory. So the Design Dialog can find these files and read the names into the list box. That makes switching color schemes easy. Download free WebTable Quick Blog Tool from this source.